I needed something I just couldn’t find in Nepal, and therefore had to order something on the internet and had it mailed. It shouldn’t have been an ordeal to write home about. Each year or so I need to have credit/debit cards sent to me and it usually costs at least $120 and this last time my brother put BA for Bagmati district in Nepal and it went to Basnia; it finally arrived. Another time I had it go to a friend in Kathmandu to his business, then I had it go to my other friend’s business in Changunarayan. These were the best plans, but I had to pay for FedX international rates for letters. So when I ordered this special cream, since it was a package, I thought I’d skip putting a person’s name on the order and just have it go to the business. After a few weeks it hadn’t arrived. I looked up the order and saw that it had actually arrived in Nepal. I sent Bikram to get it when he was already in Kathmandu. Although Bikram had the printout from the internet, the man refused to give it to him. He needed Bikram’s citizenship papers. Kamal, the owner of the school, took me the next day to pick it up. He actually brought the stamp from the school and his citizenship card. I knew better than to show my face for fear of more charges. It actually took two hours and four more trips into the post office for Kamal while I waited at the street. It got so ridicules by the end when the man finally asked Kamal what company he had ordered the items from. It was like an interrogation. The name was on the invoice in his hands, but the man was sure anyone should know the company one had ordered products from. Kamal called me to ask me. I told him to look on the invoice, but the man wanted information about the store and products. It was a medical cream. Did he really need to know where I was intending on putting it? It went like this: first Kamal needed to write a letter certifying that he had the right to collect packages for the school and needed to have his citizenship card copied. We bought one piece of copy paper from a nearby stationary store for a rupee; I wrote the letter. Fortunately, the monsoon has started and there was electricity running to make a copy of his card. Otherwise, it would have been a problem to find someone with a generator or inverter to be able to make a copy. He had even brought his official stamp for the Thangka painting school and we stamped the letter in a couple places. Done. He went back in and I was sure it would be fine. 30 minutes later here he came out again with no package. What happened? The stamp wasn’t dark enough. He left the stamp with me so he had to bring it back in to show the post master. 1. Do not put the country code with the phone number. If you do it will be too long for the space allotted and they won’t be able to contact you when it arrives. 2. Always put a name on it, preferably a Nepali whom you trust. Actually, your guest house will be fine, but put the owner or manager’s name. 3. Understand there is a difference between a letter and a package. Letters are delivered to businesses, packages are not. 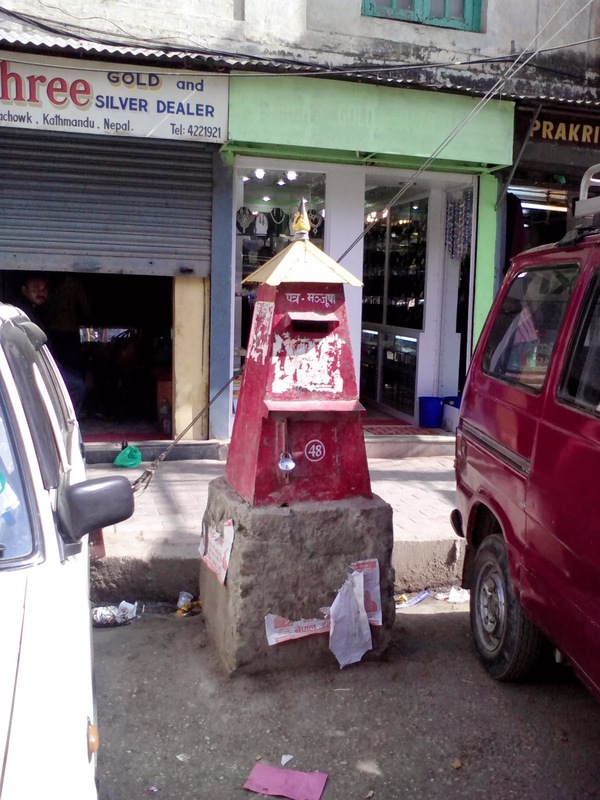 There is no mail delivery to homes in Nepal. 4. Be prepared to pay a tariff for the item, no matter how little it cost. My medical cream that cost $65, plus $44 for shipping USPS, required 650 NRs. for the tariff. I think I learned a frugal trick to get my debit cards to me next time. I will have my brother pick up a couple warm jackets at a garage sale in the US. He can put the debit card at the bottom of the box, attached with tape in the underside of the box flap. He can send the box for $44 if there are just a couple of children’s jackets with a note that he hopes ‘all three jackets will be useful to the orphans.’ I would suggest putting the cards in a jacket pocket, but someone might take the jacket. If it goes well, this should save about $75 over the FedX/UPS rates. One other trick you might try is to have the company come to you, but addressed to the UPS Office, Naxal, Bhupimarg, Kathmandu, Nepal, (opposite the police headquarters). Be sure to include your own Nepali phone number.